CU by Day: Happy Summer Solstice!! Good morning and happy Summer!! I love the summer solstice, when I was a kid we used to have a big party every year, we'd make a pinata have a bonfire and a potluck with all of our family and friends. It's one of my fondest memories and while I don't do it now, my daughter's birthday is on the 25th and so we still have an outdoor party and make a pinata in keeping with tradition. This year it's a mermaid but it's not done yet so I don't have any pics. One more week until the party though so I'd better get a move on! This week I have a fun new product to share. I've been seeing these clear pockets all over the place lately and they are so fun I had to make a set. 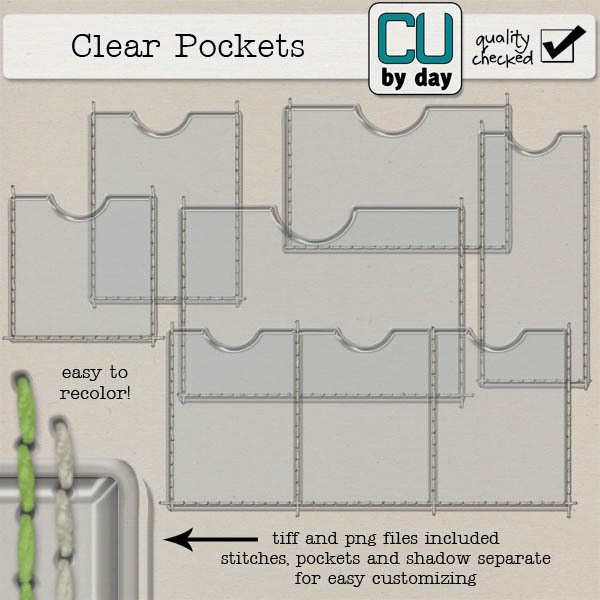 Included are 6 pockets with optional stitching and shadows. Get them now on sale, as always, this weekend only!